While Nokia is in the midst of a transition to the Windows Phone 7 OS, they are still hard at work on updates for their Symbian OS. 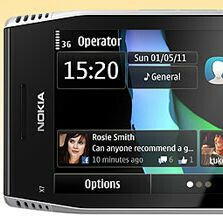 The new Symbian 'Anna' is the next version of Symbian^3, coming to the N8 and E7, as well as the upcoming X7 and E6. But early testing isn't showing very impressive results. Maximiliano Firtman, a respected developer, had the opportunity to put the new Symbian Anna through its paces. On the plus side, he points out the new features of the Anna browser, including multi-window browsing, and enhanced CSS3 support for gradients, 2D transformations, transitions, animations, and media queries. Overall, Firtman says the browser is indeed faster. But when it comes to HTML5, which has become essential to browsing, Firtman was disappointed. Symbian Anna's HTML5 support excluded Viewport support, audio/video tag support, offline storage cache, a geolocation API, and an accelerometer API. Of course you can use Flash on Symbian Anna, so it's not the end of the world. But Nokia customers shouldn't be made to feel completely neglected, now that Nokia's moving on. if it can do flash then its ok.
"HTML5, which has become essential to browsing" are you kidding me?! Not only is it still in development, only the latest desktop browsers can support HTML5, you ignoramous! So unless you're some sort of iFail fan who believes that steve jobs says HTML5 is the future and a decent substitute for Adobe Flash (arguable, but still not applicable since it's not widespread! ), you need to do some actual research before making such ridiculous and unfounded statements. I think it was you who also didn't believe that dvd's are the future because it wasn't widespread ten years ago, and that vcr's will always be the standard. So what do you think of cloud services? It's not widespread yet, so I guess it won't be essential for new devices to have that capability yet huh. By the time HTML becomes widespread, Nokia's browser will have have 2 or 3 updates. So yeah, it doesn't matter at this stage in the browsers development. Cloud services aren't widespread? What year are you living in? They are everywhere and have been for awhile. And anyone who ever used a DVD when they first came out, knew VCR's were doomed. Every single person. "you're some sort of iFail fan who believes that steve jobs says HTML5 is the future" Ahahaha you should do research, i Hate IOS ima Nokia/Blackberry Fanboy ok ur barking off the wrong tree little kid.